Successfully Added No.1 G6 Sports Watch - Bluetooth 4.0, Pedometer, Sleep Monitor, Sedentary Reminder, Heart Rate Monitor, APP (Silver TPU) to your Shopping Cart. Get in shape and stay healthy with the No.1 G6 sports watch. This stylish Bluetooth watch can be conveniently synchronized with your iOS or Android smartphone. Thanks to this, you’ll be able to enjoy an abundance of smart health and fitness features straight from your wrist. Additionally, it lets you make, reject and answer incoming phone calls as it comes with a built-in microphone. This brings along great convenience and makes sure that you’ll always be within reach for friends and family. Thanks to its 380mAh battery, you’ll be able to enjoy all the amazing features this affordable sports watch has to offer for hours in a row. When out of juice, the battery can be easily recharged via its micro-USB port. On its sharp 1.2-Inch display, this Bluetooth watch will constantly provide you with valuable health analysis. You’ll be spoiled with an abundance of smart health and fitness features that support you in working towards a healthier future. Take its pedometer for example. This cool feature keeps you up to date with the total number of steps you took and distance you have covered throughout the day. Like this, you can be assured you’ll always reach your daily activity levels. 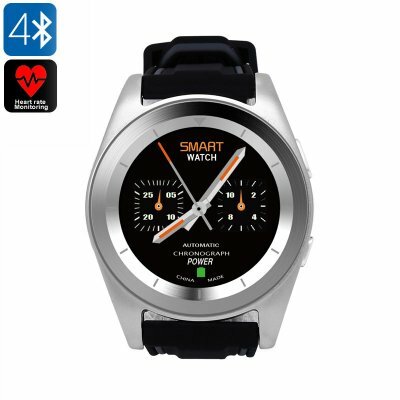 Additionally, this sports watch also comes with a heart rate monitor. Its highly accurate heart rate readings provide you with detailed information on which to adjust the intensity of your current workout sessions. Thanks to this, you can be guaranteed that you’ll meet your future fitness goals in the most efficient manner. The No.1 G6 Sports Watch comes with a sedentary reminder to make sure you’ll never miss out on an exercise session again. It also supports a built-in speaker through which it allows you to listen to your favorite songs while working out. This will provide you with the extra motivation and energy boost to get through the most demanding of sporting sessions. With its sleep monitor, this sports watch makes sure that you’ll get enough rest in between your workouts. Thanks to this, you can be assured that your muscles have been fully recovered before heading out again. This will stimulate fast and healthy muscle growth. Whether you wish to work on your cardio, lose weight, or gain muscle – this Bluetooth watch is perfect for you. This Bluetooth watchcomes with a 12 months warranty, brought to you by the leader in electronic devices as well as wholesale electronic gadgets..